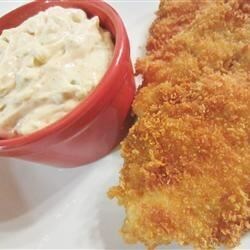 "Great tasting homemade tartar sauce for seafoods. It's packed with pickles green onions, olives and garlic. Definitely a winner." Place green onion, sweet and dill pickles, garlic, olives, mayonnaise, Worcestershire, taco sauce and lemon juice into a food processor or blender and process briefly. Do not puree. Refrigerate before serving. Great flavor, it's just abit too many ingredients to use this recipe on a regular basis. My kids eat more tarter sauce than fish.